I'm sure many of us have notice when we go makeup shopping the crazy variety in shades of pink and red on lip glosses. Colors that would seem the most natural or normal. But what about unconventional colors? There are hardly any yellow, blue and green lip products out there! I know you might be thinking that it would look so unflattering and that it would resemble something close to Shrek. Not at all. On the contrary is very flattering on the lips, especially if you have pigmented lips because green will neutralize any redness. One day I was just casually shopping at my local CCO and stumbled across a discontinued MAC tendertone in a green shade. I immediately bought it. Since then I've been in the lookout for green lipglosses. Very few are available, most of the time they are limited edition shades or high end brands with prices I cannot afford. Here is my little collection. MAC Tendertone in Tread Gently,Sephora Sweet Candy Gloss in Lime and MAC Tendertone in Shush! I know I also have somewhere MAC Lustreglass in Spring Bean, but since I moved to the new room, I haven't been able to find it. It was really my favorite because I had used half the product already. On the Right, Lime left is Sush! As you can see they are not pigmented at all, I've seen that most green glosses are sheer. So they don't stain your lips green. Below is a picture of my bare lips, and on the bottom one I'm wearing the Sephora Lime gloss. As you can see it only makes my lips look glossy, no weird color. I can't use clear lip gloss for this kind of look because my lips are somewhat pigmented and clear gloss makes the redness much more prominent. So I would reccomend if you see any green glosses check them out! I just realized this is my 100th post! It doesn't seem like, I feel like I stared this blog a few months ago. Into the subject. So I've been online shopping these days, it is just so convenient and sometimes cheaper than shopping in store. Some of the things came on the mail this week. New circle lenses from Pinkyparadise. Dueba Blossom Brown, Dueba Puffy 3 Tone Grey, and Geo Princess Mimi Grey. I don't plan on opening them all at once. I will save them for later, I only have opened the Puffy 3 tone. Review coming soon. God knows I needed these badly, my old pillowcase was hideous. I wanted pastel pink ones, but I can only seem to find hot pink ones and I don't like those because my room has more of a soft/pastel feel. So for the moment I will settle for white ones. Since I ran out of materials for a case I'm decorating, I purchased a lot of these from Etsy. I actually have another package from Fullmoon on the way. The mascara and the face mist are from Costmetic.Love which always includes free samples yay! Another TonyMoly package it's on the way. That's it's for today. Sorry for not posting anything last week, it's been hectic. I hadn't gone to Forever21 recently. Last time I went there was in February (I think). I hadn't had a reason to go because I prefer to buy my clothes online. But I had been looking for a particular item all over the internet, a flower headpiece. They are very cute, and perfect for spring, I've seen they are quite popular this season, but I didn't wan to spend so much on them since it is only a fad. Well I went to f21 because momoaisu hauled these, I asked her where she got them from. From f21 and only $1.50 ea! I only got these 3 out of the 5 different colors. Once I was there, I looked for jeans because I needed a new pair. I got these for only $10.50! I don't love them love them, because they are are stretch jeans. They are the worst kind of clothes you can wear when you are trying to lose weight because the jeans will adapt to the size of your body. You can't tell if you have gained or lost weight. I also bought 2 camis for $2.80 each, but they are not worth posting about lol. 1-I'm not the biggest VIP, I admit I recently started to listen to them, and have like them a lot so far. 2-Kpop group don't tour very often in the US. 3- Money, I just went to Smtown, I'm planning a vacation, going to disneyland and magic mountain. 4- No set day. What if it's on a weekday, I have school and work the next day. I guess those are really the major issues. It will all boil down once they release the date. In the meantime here is their latest song. 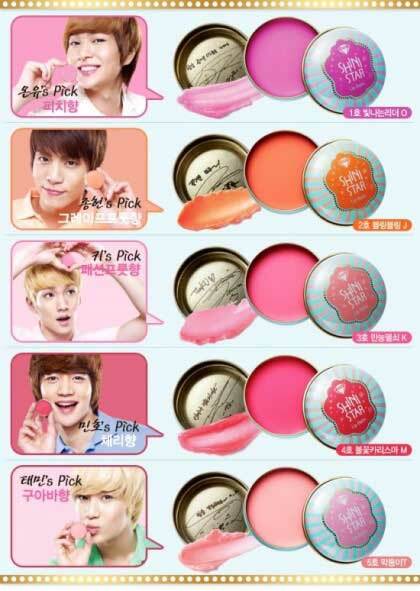 Today I wanted to review this lip balm that from Etude House. If you are a reader of my blog you would know that SHINee is working as an endorser for the Korean cosmetic brand Etude House. They recently released a limited edition collection called "Shini Star" they releaded 5 lip balms, 1 BB cream, and two compact powders. The lip balm I purchased was Taemin #5 which is the guava flavor (the one at the very bottom). I think the packaging is very cute, it is pastel overload which I love, but I do find that sometimes is quite difficult to open it. The lid gets easily stuck. I think the color is beautiful, a pale pink. I find that most pale pinks look very weird on me because they make my pigmented lips look more purpleish, and this one complements my skin tone beautifully. It is also very natural looking. It does smell and tastes like guava! I recommended this lip balm, I think I will repurchase it again! So I made another purchase of circle lenses from Pinkyparadise.com. I do like the Geo Angel Brown, but like someone commented on that review post, circle lenses are addictive, so I purchase the popular Geo Nudy in green. Here I am wearing them. So I received, the Dariya hair velcro thing, and green elephants case. Somehow I had predicted that my case would be green since my the lenses are green, I guess it was just coincidence. Here is what the look in the bottles. Here is are some closeups. I think these lenses are so pretty. The limbal ring is not too thick which makes a bit more natural and more wearable for everyday, but it still give you a fair amount of enlargement. The color is also not too bright which I like, most colored lenses look kind of fake. Also, notice how my left eye in the bottom picture has that creasent moon shape at the bottom. I love the effect these lenses give. They were also super comfortable, I wore them for around 9 hours without any problem. I would definately reccomend these lenses, I actually want to purchase another pair in blue. By the way pinkyparadise is having a sale, you buy 2 pairs and you will get another free pair with the code crazy2012.